As a practitioner you can register with the JCCP for the areas in which you carry out procedures under the relevant modalities. You can either register on the full or provisional registers based on your qualifications, training and experience. As an Education and Training provider you can now register with the JCCP to become an approved provider and to seek approval for a specific course and qualification. All practitioners who undertake procedures under the relevant modalities can register with the JCCP. The joining process is simple and straightforward. All you are required to do is complete the application process and pay the appropriate annual registration fee. Before applying to join the JCCP you must read the joint JCCP/CPSA Code of Practice and Fitness to Practice Rules. Rules. For each modality that you wish to register for you will be able to register either fully or provisionally. You can register fully under a modality when you have evidence that you have undertaken JCCP authorised education or training. You can register provisionally under a modality if you agree to comply with the joint JCCP/CPSA Code of Practice and Fitness to Practice Rules, can complete the application and have been undertaking work in the modality for a minimum of two years. These documents can be uploaded as part of your Membership application or emailed after you complete it online. If you cannot provide the above documents then this is likely to affect your application to register for the JCCP. If you submit your application and pay the administration fee but then cannot provide the documents meaning you cannot register with the JCCP you will not be due a refund on the administration fee. 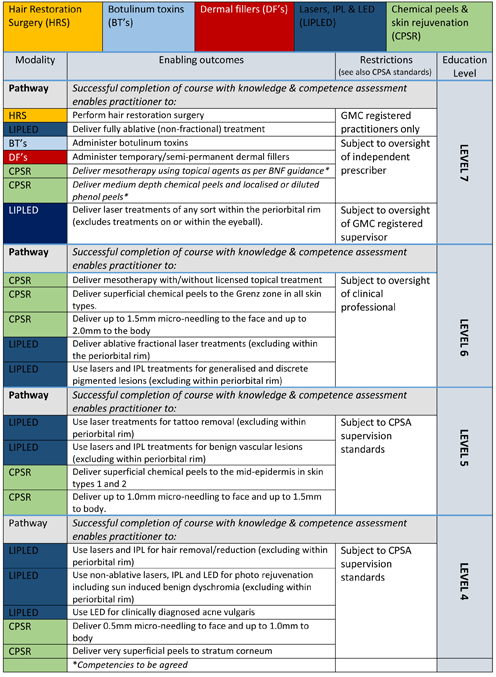 The matrix below of different procedures covered by the modalities and the level of qualification and oversight/supervision required for each. You are required to have undertaken JCCP authorised education or training to the level set out in the matrix to register fully with JCCP for each specific modality. You can register provisionally for a specific modality as long as you can complete the application and have been undertaking procedures in that modality for a minimum of 2 years. - Enable Education and Training Providers in aesthetics to demonstrate ‘best practice’ in education and training provision. - Identify courses, programmes and qualifications that have been accredited by recognized awarding bodies. - Enable practitioners to clearly evaluate the value and status of education and training programmes on offer. Training providers can register by completing the online application and submitting the required evidence to show the training provider meets the required standards. The JCCP has produced a Training Register Application Form which should be used to provide this evidence and is available here . The Application Form and any other supporting documentation can be uploaded as part of the application process. These documents can be uploaded as part of your online application or emailed after you complete it online. If you cannot provide the above documents then this is likely to affect your application to register for the JCCP. If you submit your application and pay the administration fee but then cannot provide the documents meaning you cannot register with the JCCP then you will not be due a refund on the administration fee. We process the Personal Data supplied by you to JCCP in accordance with our legal obligations under the scheme. In order to do this we will pass this information to the relevant government and professional bodies and other third parties if we are required to. Personal data will be stored for a period as required by current legislation from the date of the resolution of the action. We would draw your attention to your right to request from us access to your personal data as well as your rights to have such data corrected or deleted once it is no longer necessary for the fulfillment of your contract with us or our legal obligations as the scheme administrator. We would also draw your attention to your right to lodge a complaint with the Information Commissioner’s Office if you feel that we have not carried out our obligations under the relevant Data Protection legislation.